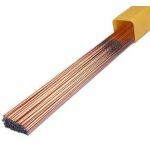 A low-carbon mild steel rod ideal for all types of mild steel and ductile weld. It is copper coated to ensure long shelf life. Particularly suitable for sheet metal panels, plates, tubes and fittings.